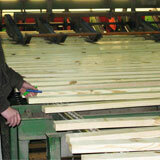 Culpeper Wood Preservers is one of the largest producers of pressure treated lumber in the United States. A leading manufacturer of pressure treated products for the residential, commercial, industrial and marine markets that employs more than 350 people. Culpeper Wood Preservers’ brand name products are sold exclusively through independent lumber dealers throughout the Mid-Atlantic, Northeast, Mid-West and South. They operate 10 plants strategically located in Virginia, Maryland, North Carolina, South Carolina and Indiana. This course will better inform the designer about southern yellow pine, best practices when utilizing it in your designs and the sustainability of the material. This course also compares and contrasts the differences between southern yellow pine and conventional choices. Through a discussion on life cycle analysis, you will have a better understanding of what makes this a sustainable building product choice.